Just a reminder that you still have until Sunday midnight to enter the first giveaway in my little giveaway spree. So, after you sign up for this one, check out the other here in a previous post. Lots of you who signed up for the first giveaway chose this as your first choice as one of the items at Rainbow Disks. You can read more about Creative Fabric Techniques on the Rainbow Disks website here. 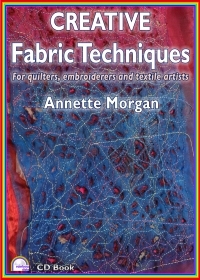 Briefly, "using innovative new techniques, top quilter Annette Morgan explains how to use existing textiles combined with sheer fabrics and stitching to create sumptuous new surfaces. She shows how to play with wire frames, wrapping, stitching, burning and appliqué to make creative squares. Using fabric as a base for piling on texture she adds paint to give surface decoration." Doesn't this sound like fun?! So, here is what you need to do! 1. Visit Rainbow Disks and come back and leave me a comment telling me what technique that is not already there that you would like to see in a new Rainbow Disks ebook. 2. Agree (we will be working on the honour system here!) to write a review of the CD after you have had a chance to see it, if you are the winner. 3. If you are a follower of my blog, leave another comment telling me that and I'll put your name in the hat an extra time. Please make sure I have a way to contact you. If you are set to "no reply" and you don't leave an email, I will draw another name. Again, you have a couple days to enter - I will draw the winner's name on April 8th. Good luck! 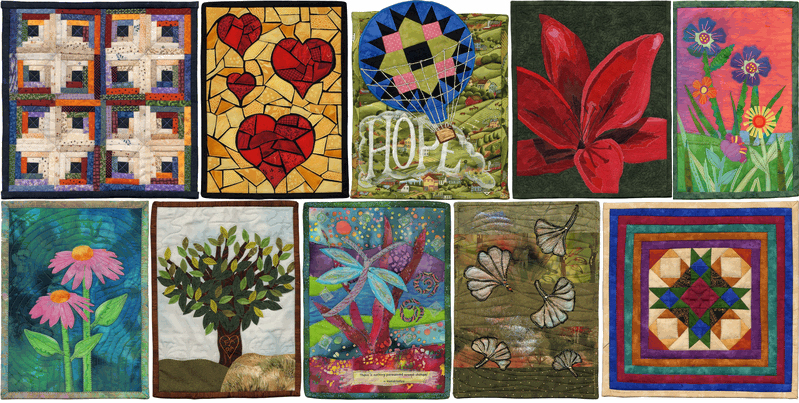 Here is a bit of a teaser for you - just some of the quilts up for auction in the Alzheimer's Art Quilt Initiative April auction! You can view the the rest here - it is always worth the click just for the inspiration! The April auction starts on Sunday so be sure to check it out! I have decided it is time for some giveaways! I have a few reasons for this - that I am paring down my stash of goodies, that I have over 200 followers now, and just for the heck of it! lol So, I'll keep this up for a few days at least. 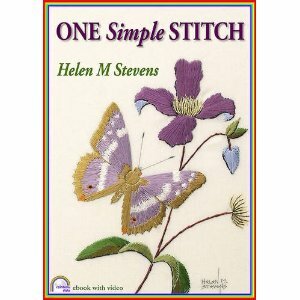 In ONE SIMPLE STITCH Helen Stevens begins a crusade to prove that if you can bring your needle up through your fabric, and take it back through to the reverse, you can embroider.... and you can work all the projects in this book. And you don't even need lengthy step-by-step instructions. All the information you need is encompassed by a template, a colour chart and a unique "directional diagram". Armed with these three weapons, and one simple stitch, you can slay the dragon that has held you back from working true embroidery. And with no counted thread techniques, there's no counting either. So sit back, enjoy the text and the videos and prepare to become a confident embroiderer. All with ONE SIMPLE STITCH. 1. Visit Rainbow Disks, come back and leave me a comment telling which disk you would most like. You have a couple days to enter - I will draw the winner's name on April 1st. Good luck! I couldn't bring myself to mail this block off Friday - I tried but I just had to try to add a bit more and improve my performance on this. I had some good advice from Arlene and tried to implement it. I used metallic thread to outline the edge and veins on the lace fan so it no longer disappears into the background. I added a top row of bugle beads to the beaded buttonhole stitch seam to make boxes and added some mauve stitching within the boxes and a larger glass bead in the center of each. Last, but certainly not least, I added the beautiful beaded heart I bought from Marie in the Hearts for Betty program. I think it is the nicest thing on this block! I'll remind you again that this program is the sale of beautiful beaded hearts made by Marie Alton and will help Betty Pillsbury rebuild her gardens, which were devastated by Hurricanes Irene & Lee. You can check it out and get more information at the link above. NOW this block is in the mail! I finished up with the fabric I rusted - I mentioned it in an earlier post while I was impatiently waiting for the fabric to develop enough rust for my liking. I embellished the rusted areas with gold seed and bugle beads as well as a few glass beads. I love the way the colour of the rust plays with the glitz of the gold beads. I am hitting several birds with one stone again with this one. It is my January Bead Journal Project (okay, I'm a little behind! lol). Also, I made it up into a small art quilt which will be my March donation to the Alzheimer's Art Quilt Initiative (AAQI). This makes my 15th AAQI quilt! Can I get a whoop? I love the way the back worked out too. As you can see, I have taken to printing out the labels for these on printable fabric with the AAQI logo. So, how thrifty was this quilt? I used a scrap of cotton for the fabric I rusted. The high tech items needed for the rusting came from an old coffee can of nuts & bolts from dh's workshop. The "rusting solution" is a mix of white vinegar and water - can't get much more inexpensive than that. The beads came from my stash and have already been used throughout a couple other projects so they didn't owe me anything. The binding and backing fabric as well as the fast finish trangles for hanging were two pages from an upholstery fabric sample book and it came from the selvage center. A whole box of these samples only cost a dollar. What is this crawling across my round robin block?! I have the privilege of being in the Fools Gold Round Robin with Arlene White in Australia. If you aren't familiar with Arlene's stitching, you should really give her blog a visit and check it out. Arlene does wonderful crazy quilting and the most beautiful goldwork and stumpwork embroideries. I don't usually post photos of round robin blocks until I have them home but I couldn't resist sharing the photos of the stumpwork beetle Arlene has stitched on my block, so with her permission here are her photos. Stumpwork is such an ugly name for such a beautiful technique! Stumpwork is the name given to a style of raised and padded embroidery, originating in England in the second half of the seventeenth century. Like the wings on the beetle, parts of stumpwork are worked separately from the embroidery and then attached after. Check out the body of the beetle - isn't he just magnificent? Arlene said she couldn't resist using real goldwork supplies for this little guy in spite of the round robin focusing on faux gold used in traditional goldwork techniques. I can't say I am sorry about her decision! Thank you for your generous stitching on my block, Arlene. I have lusted after one of your beetles forever and am thrilled to have one now of my very own. I can't wait for him to get back home to me so I can see him in person. Photos never do embroidery justice! I finished my work on Barbara's Fool's Gold round robin block. This one didn't speak to me like the last one, probably because I have a terrible cold and my muse has flown the coop til I'm better. Up in the left hand corner is a flower spray with Rambler Roses done in metallic gold thread, beads, leaves cut from gold ribbon and stitched on and some Japanese gold thread couched down in a filigree. I used several gold trims and added beads and stitches in gold rayon thread and variegated purple DMC floss. I added the purple here and there to tie in with the purple tones in the silkie. There are several beaded seams as well, a heavy gold trim around the silkie, crystals, and a sequin and lace fan. I hope Barbara will like what I've done. Just wanted to say that Pam has a stitch diagram for this on her blog so check it out. For the next Build a Seam (BAS) Challenge, I have chosen the Rambler Rose. From the references I have been able to find, this appears to be an old stitch - I cannot find any current tutorials for it so I am including one here. I apologize for the gold metallic on white - it makes it difficult to see but it is my current project so there you have it - killing two birds with one stone again. Begin by making three or four loose straight stitches for the center of the rose. Work your way around and around the center, using outline stitch. Make the stitches closer to the center loose so the work will stand up, then draw stitches tighter as you work you way toward the outside edge of the rose. These are the roses you end up with. Mine are far from perfect since this is a first attempt at them but I think I will be using them again. It's always nice to add another way of doing roses! I barely scraped in under the deadline for taking part in the Embroidery Association of Canada's annual ATC swap but I got some done and have sent them away. I love this annual swap and have taken part for several years now. 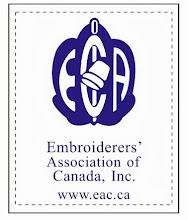 If you would like more info on EAC (Embroidery Association of Canada), or would like to browse through the photos of ATCs from previous year's swaps, head on over to the EAC website. 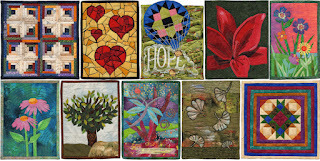 I made eight ATCs for the swap this year. They are all done in bridal fabrics - I am really into using up that stash at the moment. Three blue tubs of wedding dresses seems a little excessive, not that these ATCs made much of a dent! This year's cards are just basic crazy quilting with seam stitching only, other than a few pearls, a bit of tatting and some lace. I only used two different threads on the cards - a green silk and a variegated perle. I was going with a monochromatic thing on most of them. So, these are winging their way to Halifax to be swapped out now. This last one is not in the swap - it is on it's way to a dear lady who is having a hard time right now. I hope it will give her a smile when she opens her mail. What a great mail week I had - so many goodies found their way into my post office box! I will start with an extreme closeup here so you can see Marie's gorgeous beadwork. This is one of the Hearts for Betty that Marie Alton is making and selling to raise money for Betty Pillbury to use in rebuilding her herb garden business. I am sure no one needs an explanation of who Betty is, one of the great crazy quilters, but you may not have known that she has a herb business which provides her livelihood. This business was devastated this last year by extreme flooding. You can read about Marie's Hearts for Betty project here and learn more about Betty by visiting her blog here. As you can see, the hearts are put together as floating pendants - so pretty! I also think they will make a wonder addition to a crazy quilt block and $5 is a reasonable price for something so lovely! The second package to find its way into my mailbox was a copy of Cindy Brick's book, Hanky-Panky Crazy Quilts, autographed by Cindy herself! I follow Cindy's blog, Brickworks, and she had a post a little while ago about the Suffragette Quilt (check out the quilt on her post here) going up for auction and asked for guesses on how much it would go for. I guessed (waaayyy low) but Cindy generously send everyone who guessed a copy of the book. How cool is that? Thanks Cindy! Looking at this book is getting me all excited about all the vintage embroidered linens I have collected and what I can do with them now! Last, but certainly not least, on Thearica's blog she has a Linky Party each month where we turn our round robin and swap blocks into a finished item. It is a great motivator to finish some of those UFOs into completed pieces. I won a $20 gift certificate to Thearica's store. 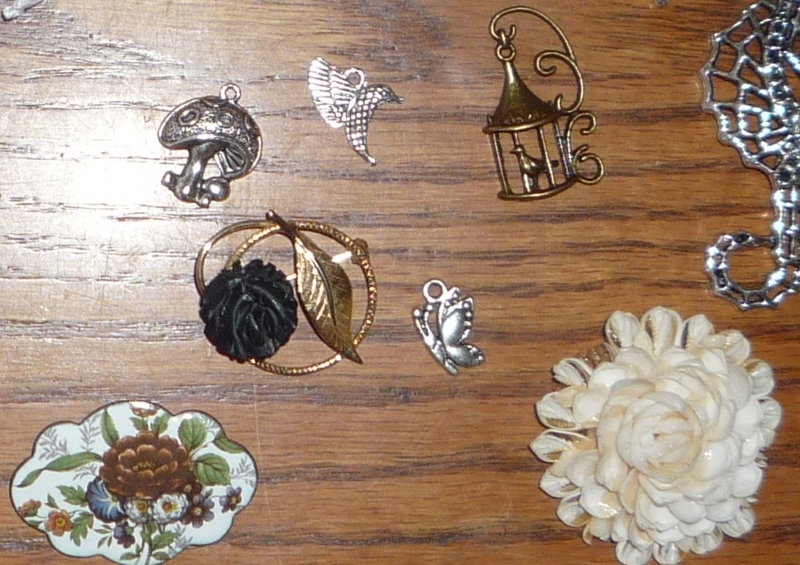 I had a wonderful time choosing lace, vintage jewelry and charms for use on quilts. Check out these gorgeous vintage pins - I love the shell flower! Look at the pile of lace trim - enough to finish off the wallhanging I am working on! So, all this for $20! Quite the deal I think! The seahorse pendant is larger than I realized but as an added bonus his tail is hinged so it moves back and forth. So cute! I love going to the post office and opening all these goodies. Thank you to everyone for your generosity. After almost a week, I was finally ready today to take the washers and nuts off my fabric and wash it off to see the rusting patterns. I love the colour of the rust and can't wait to get out my gold beads to embellish it. Even the reverse of the rusted fabric is enough different that it gives you two valid choices as to which pattern you prefer. The first two photos are of the bottom piece of fabric that was under the nuts, etc. and the second two photos are both sides of the piece of fabric that was laying on top. This one is a bit more subtle. I can definitely see possibilities here and think it will be a lot of fun to work with this fabric. I predict that, much to my family's dismay, there will be many more of "Mom's science experiments" taking up residence on the kitchen counter for weeks at a time. Thank you to everyone who gave me advice and hints on this project. I have learned that adding a tablespoon of bleach to the water/vinegar mix will speed up the rusting process although it will result in weaker fabric, which may or may not be an issue depending on what you have planned for it. I also learned that using metal bits that already have a bit of rust will speed up the process a lot, instead of using shiny new ones like I did. Most interesting I think was the idea of using steel wool since it will rust so quickly. So, this is what it turned out like. One piece I will save as a sample for future classes and one I get to play with now. The next unveiling will be once it is beaded. Rusting some Fabric - WIP Wednesday? I think I have mentioned before that I have been busy making up samples for a Fabric Manipulation class I am scheduled to teach. This is my sample in progress for rusting fabric. The first step is to line something with plastic wrap to hold it all while it is rusting. I "borrowed" a big coffee can of nuts, bolts, screws, etc from my husband's workshop to to create some rusted designs. After saturating the fabric with a mix of half water and half vinegar, I arranged some washers and screws in a vaguely floral design (at least to my eye, lol). The instructions I followed instructed you to wait for between 24 hours and a week. It looks like it will be closer to a week for mine. I'll post the big unveiling tomorrow - stay tuned! 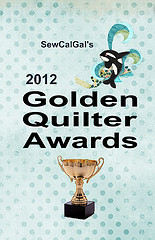 It is time to run over to SewCalGal's site and vote for this year's Golden Quilter Awards! 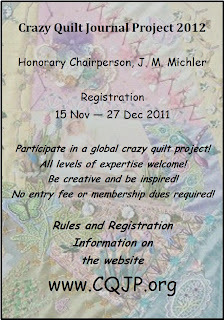 I am very excited to see crazy quilting represented under the categories of Best Designer and Best Teacher/Instructor! So, let's get out and vote and see our favourites get a little extra recognition! Look at these delicious vintage kimono fabrics! I was so fortunate to win the package as one of the door prizes in the online crazy quilt show on Thearica's blog last month and they arrived in my mailbox recently - I just had to share! There are 9 pieces of fabric in the package, each one measuring 7 X 14 inches, which is a pretty generous size cut of fabric. Since I will be using them for crazy quilting, a little fabric goes a long way - and this much fabric will go a very long way! This is my favourite of the nine fabrics included in the package - so pretty and such a great selection of colours to build a block around. In fact, I am using this fabric as the focus fabric in the kits I am making for the Fibre Options class and I am making 20 kits! Are you wondering where you can get this and other great things if you weren't lucky enough to win them?? Check out One World Fabrics online to see packages of vintage kimono fabrics like mine, African Mud Cloth, Australian Aboriginal design fabric, Japanese natural taupe fabrics, and so much more! Block for Class Sample Done! I was recently (very recently as in last week) asked to teach a class at Fibre Options, an all day stitching event being held in May in High River to benefit Victoria Quilts, an organization which provides quilts for cancer patients. I was very excited to be asked and, of course, I said yes right away. They needed a class proposal and photos of a class sample immediately so that is what I've been doing while away from my blog, groups, and basically everything else in my life the last few days. I decided on a small purse as a project. I will put together kits for this, including a pre-pieced block so we can get right down to the fun of embellishment. This is the block that will make up the flap on the purse. The blocks are pieced from vintage kimono fabric, quilting cotton, silk, lame, rayon, brocade and a silkie I printed. There are a few simple seam treatments so I can teach them some basic embroidery, a bit of beading and, of course, a sprig of cherry blossoms made from sequin flowers. Making sequin flowers seems to have become my new favourite thing! Hopefully, this will give them a taste of embellishing and make a few more converts to crazy quilting! So, how are those goals going? Every post needs a photo, so here is a cute one of "my boys" asleep on the sofa! Aren't they the cutest?! 2. I will take part in Sharon B's Take a Stitch Tuesday and stick with it as much as humanly possible. I may not push the envelope every week exploring the stitch fully, but I will attempt to at least use the featured stitch every week. See, I had to pat myself on the back on that first goal because I knew it would be downhill from there... Well, here it is week 9 of TAST and I have managed to do and post five out of the nine so not too bad. I still have hopes of catching up and keeping up so I am not giving up on this one. 3. 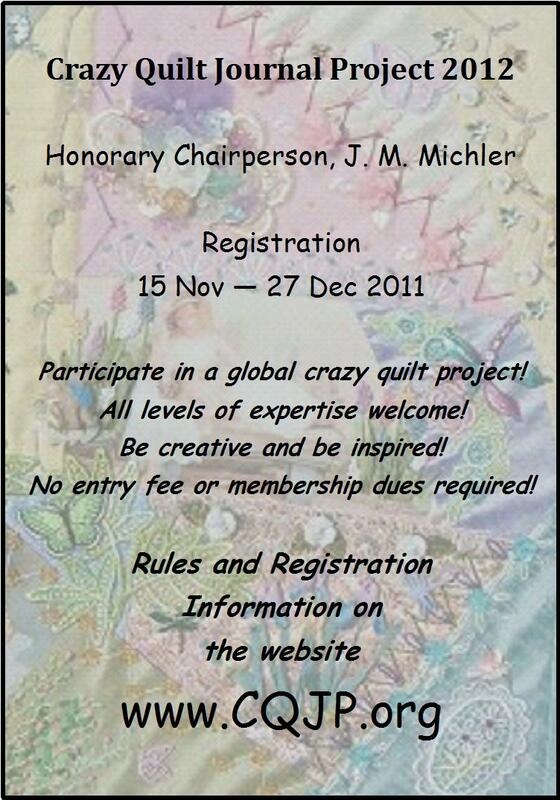 I will take part in the Crazy Quilt Art Project each month on a personal level as well as serving on the committee. I will work on blocks each month that will be put together at the end of the year. The quilt I envision making will be a gift for DH - a sort of memory quilt of our lives together, where we have been and where we are going. There will be blocks for family members and major events in our lives, the things we love, etc. I can't wait to start embroidering fishing lures, lol! 4. 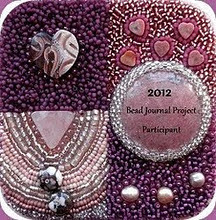 I am going to take part in the Bead Journal Project this year. I am not going to over commit here - I am thinking I will only be making ATC size pieces, postcards at the largest. However, I do want to explore more beading techniques in my work and this is a good place to start. I actually have one of the two month's ready to post photos of. I am having to incorporate this challenge in with other things I am doing since I do not have enough time to do each separately. I think I will catch up on this but either way I am not going to beat myself up about it. That isn't the point of challenges as far as I can see - the point is to challenge yourself and stretch a little and not to give yourself another reason to do guilt. 5. Build-a-Seam (BAS) Challenge - I commit to continuing to post BAS stitches regularly here on my blog and over at CQI for those of us who are still enjoying this challenge. Regular posts! Not doing too badly on this one. No, I am not managing to post every single week, as usual, but I posted a new stitch (sequin flower) last week and will work on one to post for tomorrow. I just checked and I have posted five BAS so far this year so am averaging every other week - need to get more on the ball! 6. I will keep my blog up - posting at least half the days each month. 7. I will get my Etsy shop up and running the beginning of February and keep it going. 8. A new goal this year is to find a way to have my work exhibited at least once a year. This is a bit of a cheat since I already have it scheduled for 2012 but I need the goal to keep it up in future years and I will need to work on it in 2012 to have it happen in 2013 so that is why it is here. Also, since I already have it scheduled it means I will achieve at least one goal! lol This is also a great motivator to actually finish things - with the little show coming up in January, I have been on a "finishing frenzy" here the last week or so! As soon as I get the camera (which disappeared on Christmas Eve) found again, I'll post some pics of what I have accomplished. Like I said, it was a cheat since I already had it organized and ready to go in January! So, with my Artist of the Month exhibition for the month at the Vulcan County this one is a done deal. Still need to think about organizing something for next year - hopefully an opportunity will present itself! 9. I will write at least two pieces and submit them for publication again this year. Once again, I don't expect to get two pieces published, but I would like to at least write them and submit them - that is the goal. Nope - haven't done a thing yet although I do have ideas churning away. I need to bite the bullet and put some time into this and make it happen. 10. I will continue with the cq teaching and work on both the number of classes I teach, the venues, and the quality of the classes. I have taken a number of great classes from wonderful teachers over the years so I know what makes a good class - I just need to work on achieving a similar experience for my students. As usual, in the spring most of the continuing ed classes I want to teach are cancelled due to lack of registration but it is sort of to be expected in such an agricultural area. Spring is when farmer's wives are driving tractors, not embroidering! lol Still working at it though and am teaching a class this month on Fabric Manipulation for the Calgary Guild of Needle and Fibre Arts. I have also been asked to teach another cq class that I am really stoked about. I'll write more about this later! 11. I will finish my crazy quilt Christmas tree skirt in progress in time to enter it in the Calgary Stampede Creative Living competition next summer. I think this is the third year I have promised myself I would accomplish this - third time the charm? I went right off on a tangent here and got excited about other projects instead! Time to dig it out again and persevere! Can't wait to share the project I am excited about doing for the Stampede now though - as a little teaser I'll tell you I had to buy myself a Dremil drill for it! Are you curious yet? 12, This year I will enter at least four competitions with my stitching - that`s one every four months so it sounds not too intimidating! It is harder than it sounds but with the "Crazy Quilts are Quilts Too" online event coming up at Pigtales and Quilts, I at least have one scheduled to take part in so far! Working at it! I entered the online show and had a blast seeing all the wonderful entries and reading all about the other cq'rs. Great show!! I'm working on a wall hanging now that I hope to enter in the Heritage Park Quilt Show in Calgary later this year. I have my Stampede entry firmly in my head and my Dremil drill in my hand so that will be three... This one will work, I think! 13. I will create and give at least one item a month to charity - this will be my service project for the year. I will post pictures to keep myself honest. Some of the groups I would like to do some work for are the Alzheimer's Art Quilt Initiative (AAQI) continuing with the pledge I have made to them of a quilt a month. I am very happy that my local guild, CGNFA, has adopted the AAQI as their charity for the coming year! In addition I'll be trying to make small things on a local basis like baby quilts and baby sets for the hospital gift shop (profits go to the Ladies Hospital Auxiliary) and knit caps for the newborns at the same hospital as well as placemats for Meals on Wheels. My local public library and the school next door to me both have silent auctions each year so I would like to donate to both of those again. There are actually a lot of things you can do locally if you look around. Even the local library is in need of book bags for the local literacy program. Finding a place to donate is never a problem - just finding the time to make the items! Doing well on this! I have done two little quilts for AAQI so far this year and have plans to do other things as time allows. So far, this goal is met! 14. I will once again re-organize my studio and try to contain my stash to that area. It has managed to burst out again and take over the entire house so it is time to rein it back in. This year I commit to keeping the space workable as well as getting it that way. This won't be an easy one. 15. I firmly believe you get out of something what you put into it so I am committing to giving my time and energy to both my local guild, Calgary Needle & Fibre Arts, as well as the Embroidery Association of Canada during the coming year. Done deal! 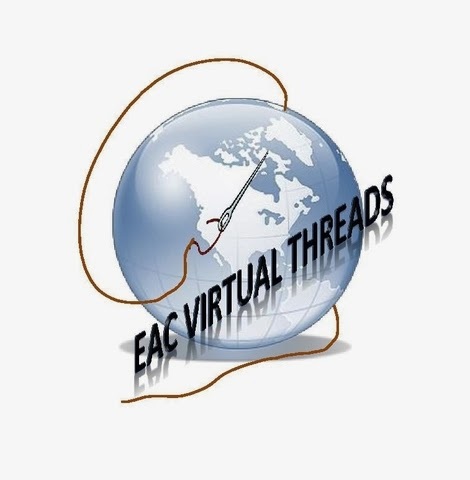 I am serving in the position of maintaining the Archives at the Calgary Guild and will be taking over the position of Praire Pacfic Regional Director for the Embroidery Association of Canada later this year. Ta-dah! 16. Here I go again setting myself up for failure! lol I'm putting my idea of a Homemade Christmas back in my goals for this year. I did have partial success last year and I think if I can manage to start now instead of November, I'll do better this year! So, this goal is to make my gifts and stay out of the stores next December. Not bad! Not bad! I have a couple gifts made already and recently got myself some sane quilt kits to work on. I am managing to keep this on the front burner so it should be possible to accomplish. 17. I chose "journal" as my word for 2012 so I will explore it by playing with art journals (a new thing for me) as well as keeping up with the Crazy Quilting Journal Project and the Bead Journal Project. Well, I'm working on it! lol - will post as more progress comes! I LOVE, LOVE, LOVE making stitching goals each year! This is my third year of doing it and I really do accomplish a lot more now. These goals keep me focused and "working on it". Try it - you'll like it! And, no, you don't have to wait for January 1st to do it! The Linky Party on Thearica's blog has me inspired to finish a UFO with swap blocks! These are the blocks I will be using and I have to say the Tea Time theme was one of my favourites so I really should use them in some way. This round robin took place in the Crazy Quilting International Yahoo group. Here are the five blocks I received back in this DYB round robin, each of which is 6" square. I finished up the leftover block - the one that comes back from the DYB for me to work on - and here it is. Now I think I will be putting them together into a small wall hanging, hopefully during the month of March so that I can complete it in time for the Linky Party prize draw! If you would like to get some of those blocks out of the pile and used, why not join the linky party too? I imagine everyone is getting tired of looking at this block of Wendy's I have been working on but I finished it today so I thought I would show you what else I added to it. I decided the third (and last) motif on the block would be a paisley which I thought tied in well with the peacock theme. I started by couching down a double row of Japan gold-ish thread around the paisley shape. I added a fan shape of bugle and seed beads at the fat end of the paisley and some more seed beads leading from there back to the small end. I filled in the small paisley shape inside the big one with satin stitch in metallic thread and then added three feather charms and a sequin flower (remember these from last week's BAS?) The finishing touch was the sequins around the outside. I decided I wanted a scalloped edge around the outside so I used sequin trim and cut one third off each sequin on the trim before I stitched them down so they would snug up nicely to the Japan gold (yes, I was getting a little obsessive at this point! lol) For the most part, it worked though! And there is the completed block which will be in the mail to Flora bright and early Monday morning. The feather motif was large so there was only room for three motifs and three seam treatments. It looks a bit unbalanced with the heavy seams and the airy feather but I think Wendy will be pleased anyway. Thrifty Thursday - Lots of Lace! March AAQI Auction is Going Live this Morning!